She entered this world 98 years ago tomorrow — on the 21st of April 1915 — in Texas. And she left it 76 years ago today, on the 20th of April 1937 — one day shy of her 22nd birthday. And there may be no-one alive today who knew her well. Her name was Bonnie Mae Cottrell. She was my grandfather’s first cousin. And it pains me to have to admit that, so far, I have only five entries in my Master Genealogist database on this cousin. And then there are the last two entries. She never married. Never had children. Never saw the world beyond a small part of Texas and Oklahoma. Never really had a chance to live before she was taken. And can be remembered only through five entries in a database … and — thank heavens for the Jackson family — one beautiful photograph. Thank you: not for myself but for the future family members who will be searching; who will know a daughter/sister/cousin once existed but seems to eluded us. I have made it a point to publish reports on people I have found who do not have any descendants. I hate to think that someone could live and die and then be forgotten: that would have to be one of the greatest tragedies of genealogy and humanity. Nicely said, Tim. We all have a duty to those who came before us to tell their stories, particularly if they left no direct descendants to do it. And what a beautiful photograph it is! Thank you so much. This was a lovely tribute to her. I have a great fondness for people in my family tree who died young and didn’t leave any descendants. They deserve to be remembered, too. They do deserve it, Julie, and it’s nice to see so many of us stepping up to make sure they are remembered. It really does seem that they reach out to us, doesn’t it, Jacqi? Somebody to tell their stories…? I enjoyed reading about Bonnie! Now she is known! At her father’s side. Quite lovely, and a brave expression on her face. A death of pneumonia at this time might have meant she was plagued by “weak lungs” or some form of TB, and that was why she was not attending school. One of my grandmothers died of TB in 1924, and the other spent some time in the 1910s in a sanatorium. You express it well, that she never really had a chance to live. A lovely tribute. 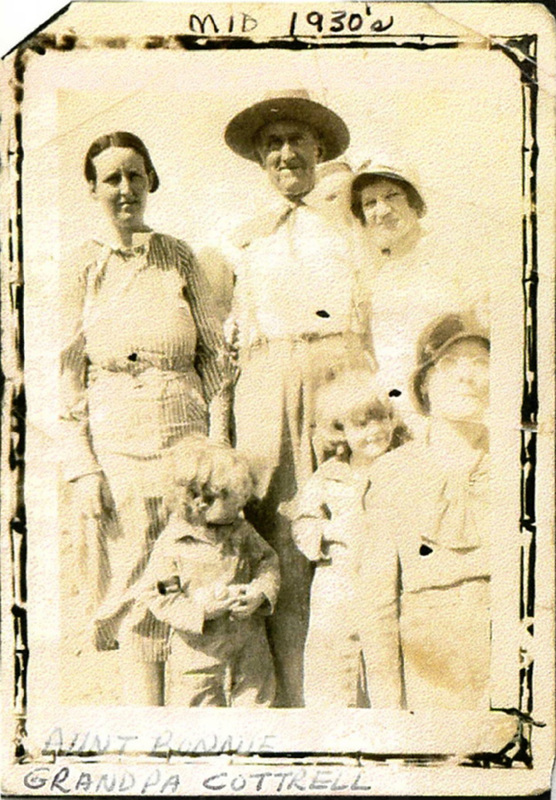 I’m always so happy when a picture is found to put a face with cursory entries of dates – and especially those photos that include other members of the family. Thanks, Kathy. I’m so very grateful to cousins who’ve provided photos like this. Thank you so much for sharing her story. I’m new to genealogy and appreciate your blog very much. My family story includes Hockley county so it was a pleasant surprise. Because of genealogy I’m learning so much about this area of the world I never knew, and I’ve lived here all my life. Greetings from the Dust Bowl! Thanks for the kind words, Stephanie! Good to hear from someone else with family in Hockley County!